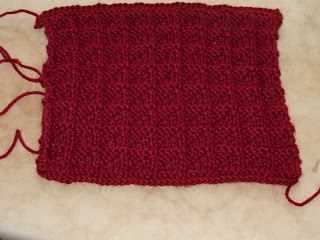 Last week the 4th step of the Bernat Knit Along was posted. I started knitting the posted pattern and after 20 or so rows I decided I really, really didn't like that stitch and that it would bother me forever if that block was in my afghan, so I ripped it out. I found another pattern in a book I bought a million years ago, 'Knitting Encyclopedia 1500 Patterns by Pingouin'. It's a terrific little book that I use every so often. I made 9 repeats of the pattern across the block and 8 repeats in the length. I am much happier with my choice. Two more colours to stitch up. It has taken a bit of conscious effort to keep up to date with this project, but definitely worth it. I want to get it finished in a timely fashion and this process is really helping. I started a new project this week. Its a scarf (how many of those have I stitched this year?). It's from the 'East + West' pattern book by Mission Falls. 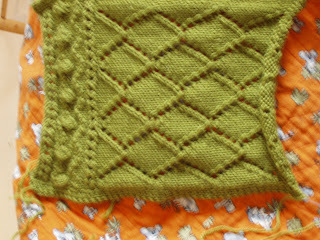 Don't you just love that luscious green wool. It's for a friend in Australia. She lives in the Melbourne area where they had those destructive fires last year. Everything was blackened and she seemed so sad. This will be her own little patch of grass. I have to stitch 12 repeats of the diamonds. This wool feels so nice in my hands that I want to make the sweater that also uses these motifs. But that one I would have to keep. I have made one other project from this book and find their instructions very good. I had a problem with the graph and sent them an email and later that night I had a response that answered my questions. Good company to deal with. Back to that other project from this book. I never finished it. arg. Later today I am going to post a stitching challenge that you are invited to join. You'll like this one. I'll tell you about the project and maybe add a photo. Yes, I am going to embarrass myself. Please come back and read all about it. Darilyn over at Tropical Screamer has posted a new block for her Sampler Quilt. Anya over at Hills Creek Quilter has finished 9 additional blocks for her version of the Dear Jane Quilt.